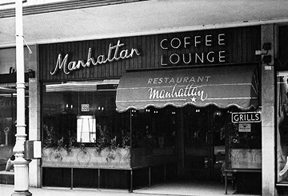 The Manhattan was entered through a glass door set back from the pavement. Apart from the light that trickled through the large leaved plants in the windows, the illumination came from low wattage wall lights and a large brightly lit juke box that struggled to be heard above the frothing of the Espresso coffee machine near the counter. The nicotine tinged ceiling was covered in twisted cigarette foil 'egg-cups' that had been made with the foil from cigarette packets - the ‘egg cups’ had a cup at one end and a sticky pulp made by chewing the tissue paper peeled from the silver paper at the other end. The ‘egg cup’ was thrown upwards like a dart to stick on the ceiling. The lounge had two distinct sets of customers, the Southsea ladies during the daytime and mods in the evening, young people drawn tthere because we all knew something exciting was happening. Some you maybe saw once but not again, names were not important it was being together that was, fighting the system ‘Anyway, Anyhow, Anywhere’. The mod girls in leather coats or blue nylon macs and Hush Puppy shoes had a choice when they entered the Manhattan. The scooter boys on one side dressed in ex-army, fur and badge covered khaki parka jackets, oily fingers clutching coke bottles as they lounged over tables littered with cigarette ends. On the other side sat the 'faces' in smart Italian suits and reefer jackets sipping coffee and talking about fashion and obscure American R 'n B groups. Some of them had scooters, usually Vespas. Money was scarce so we tried to make one drink last all night, coke was the best choice because it was hard trying to look cool drinking coffee with a thick cold skin on top. Some mods worked in the Dockyard as apprentices, or were trainees in small businesses. It was handy to know people who worked in the Dockyard because they had access to equipment that could chrome bits of scooter. They could also get some work done on engine parts by skimming a few thousands of an inch off a cylinder head or put larger jets into carburetteurs as we tried to get more speed from our machines. Some scooter boys put Castrol R, a synthetic two-stroke oil used in racing engines, into their fuel to leave a distinctive smell in their wake. Southsea Common 1965 scooter rally. 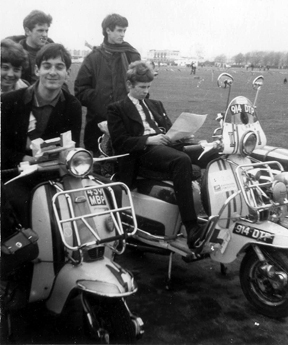 Mary, Steve, Stu, me (back right) and Rick who is sitting reading on my Lambretta, 914 DTP. “….most Pompey Mods knew each other from schools like the Technical High, the state Grammar Schools and the many secondary moderns around the city there were only a handful of people at <?xml:namespace prefix = st1 ns = "urn:schemas-microsoft-com:office:smarttags" />Portsmouth Grammar School who were involved in the mod scene. A couple were older than me, Glyn and Nigel Grundy, sixties photographer, artist and now fellow university lecturer. 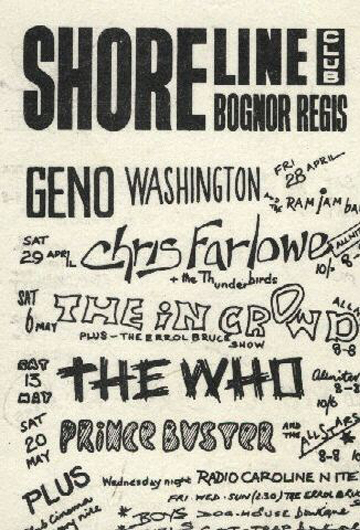 Otherwise there was Martin, Brian and me and that was pretty well it in the early days”. 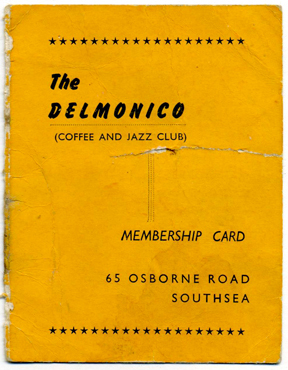 We also went to the Delmonico coffee lounge in Osborne Road, it was run by Charles, who looked and moved like the butler in Thunderbirds. There was a cellar club below stairs called the Hideaway but it wasn’t popular. The Moody Blues went into the Delmonico when they played at Kimbell’s and a girl followed them back and wrote ‘The moody’s walked here’ in chalk all the way back to the ballroom.